A bOLD, evocative, unpolished beer tower design, showing the progressive craftsmanship & energy of the young brew-masters at Kornuit. 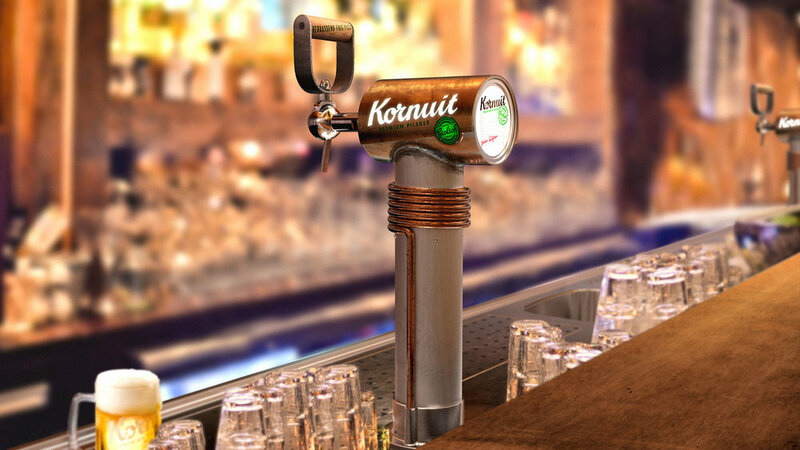 Kornuit, a young, bold Dutch beer brand, young at heart, masterful in brewing, brings a surprisingly fresh beer by the new generation of Grolsch brew-masters. With a foundation of heritage, beer craftsmanship & knowledge, the young brew-masters at Kornuit are going forward and infusing it with a youthful, strong-willed, creative & fresh look at the world, full of ambition and energy. Most of all, they focus on what's important, making good beer and being comfortable with yourself, not worrying about making a polished appearance. Kornuit tower @ Grand Cafe Cornelis, Epe. This character is translated and shown in the design of the beer-tower where straightforward shapes & components, showing construction, seams/welds, layering, are founded in functionality and remain pure in aesthetics, timeless and non-conforming to contemporary shapes/styling. The raw look, almost as if it was build by the bar-crew/brewer in the shed/garage behind the café/restaurant, as part of the maker revolution. Kornuit tower @ Scharrels & Schuim. The top of the tower functions as a beacon with high visibility, recognise-ability & branding from the sides, where Kornuit is cut from the copper outer layering and back-lit. At the front, a 'headlight' provides more Kornuit story, as well as a tribute to the very first Grolsch brew-master; Peter Kuyper. A cooling coil to cool the beerlines is wrapped around the insides & base, and emphasises the straightforward reasoning by not trying to cover up functional components. The big, bold, unconventional handle, made from steel and wood, further shows the confidence while drafting beer with its big grip & movement, stamped with 'surprisingly refreshing pilsner' in Dutch,.